Dr. George was born in the midwest and lived in Kerala, India during her early childhood years. She then grew up in New York City. After high school, she completed a combined B.S./M.D. program and received her medical degree from SUNY Downstate School of Medicine in Brooklyn, NY. She moved to Massachusetts afterwards to complete her residency in pediatrics at Tufts University/Baystate Medical Center. 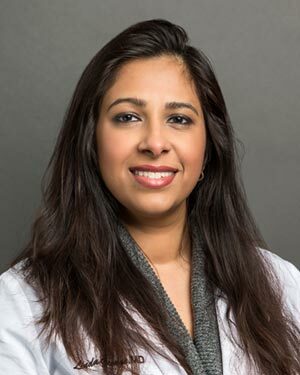 Prior to joining Pediatric Associates of Alexandria, she worked as a Pediatric Hospitalist and Assistant Professor of Pediatrics for the University of Massachusetts Medical Center. Dr. George is a board certified pediatrician and a member of the American Academy of Pediatrics. Her clinical interests include well child care, newborn care, preventative medicine and endocrine disorders. Dr. George is certified as a breastfeeding specialist. Outside of work, she also enjoys cooking, hiking, traveling, outdoor concerts, and visiting museums. Dr. George lives with her husband, daughter, and son in Northern Virginia. Dr. George can speak both Spanish and Malayalam.